Many areas of the world are at risk from landslides and their consequences; rainfall-triggered landslides particularly affect developing countries in the tropics. 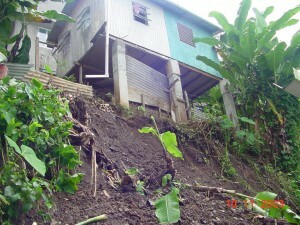 Rapid urbanization and the associated growth of unauthorized and densely populated communities in hazardous locations, such as steep slopes, are powerful drivers in a cycle of disaster risk accumulation.Frequently, it is the most socioeconomically vulnerable who inhabit landslide-prone slopes – thus increasing their exposure to landslide hazards, and often increasing the hazard itself. There is growing recognition that urban landslide disaster risk is increasing in developing countries, and that new approaches to designing and delivering landslide risk reduction measures on-the-ground are urgently needed. In response to that challenge, we have developed a novel methodology, Management of slope stability in communities (Mossaic), the vision for which is to provide low cost, community-based solutions, such as low cost drains and other related measures to reduce landslide hazard. A 3 minute video introduces the Mossaic approach to landslide mitigation in urban areas in developing countries. MoSSaiC (Management of Slope Stability in Communities) is an integrated method for engaging policy makers, project managers, practitioners, and vulnerable communities in reducing urban landslide risk in developing countries. Mossaic is thus not of itself a design tool. Mossaic was begun with the idea of combining research, policy, and humanitarian interests to address rainfall-triggered landslide hazards through community-based implementation of surface water management measures in vulnerable urban communities. Disaster risk mitigation pays, and investment in reducing rainfall-triggered landslide hazards in vulnerable communities can often be justified. Engaging existing government expertise for implementing risk reduction measures can build capacity, embed good practice, and change policy. Ensuring community engagement from start to finish can establish ownership of solutions. providing evidence that mitigation can pay—socially and economically, directly and indirectly (evidence base).